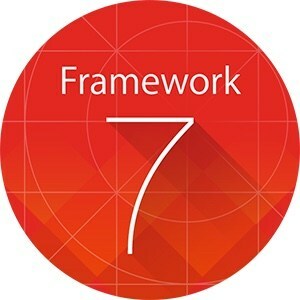 Framework7 - is an open source mobile HTML framework to develop cross mobile apps or web apps with iOS native look and feel which allows to create mobile user interfaces with native-like look & feel. It offers a variety of components, ranging from simple buttons, media lists, accordions, smart selects, modals, and popups to FAB's (floating action buttons). The main benefit of Framework7's cross platform approach is that there is no need to develop different apps for iOS or Android. Framework7 recognizes which device the user is using and loads the according CSS to fit the native look.